Join us on this our third journey to once again discover the beautiful Sicilian countryside and re-visit the old Targa Florio circuit. Steeped in racing history and lore, the Targa was undoubtedly the greatest road race ever. 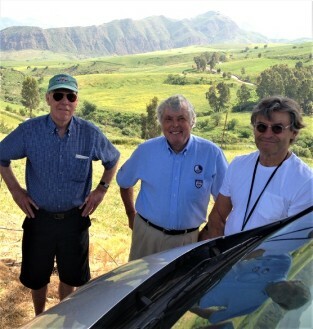 We’ll journey the Sicilian countryside, villages and the mountainous circuit that has challenged the skills of the drivers and thrilled the spectators alike. Once again we’ll be joined by great drivers and personalities. Brian Redman, Richard Attwood and Alain DeCadenet will explain the race and their experiences and we’ll meet some of the local drivers and enthusiasts who were involved with the running of the event. There will also be plenty of relaxed touring, some wonderful restaurants, the beautiful Sicilian coastline and a mix of evening entertainment. 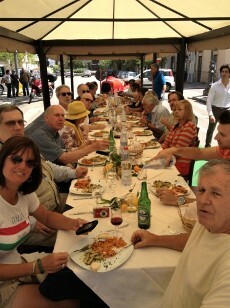 During our five days we’ll experience the beauty and the people that make any visit to Sicily memorable. 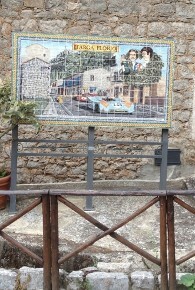 The Targa still holds a terrific amount of interest and excitement for the Sicilian people. 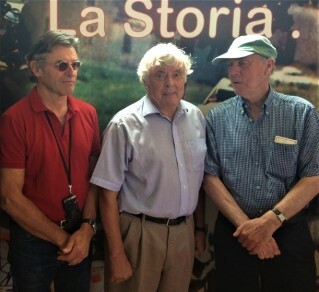 We’ll visit a number of museums dedicated to the race and anticipate meeting with the great Sicilian driver Nino Vaccarella. The naturally beautiful countryside contains ancient villages, clinging to the hillsides, where the ambience retains the old feel of the island. 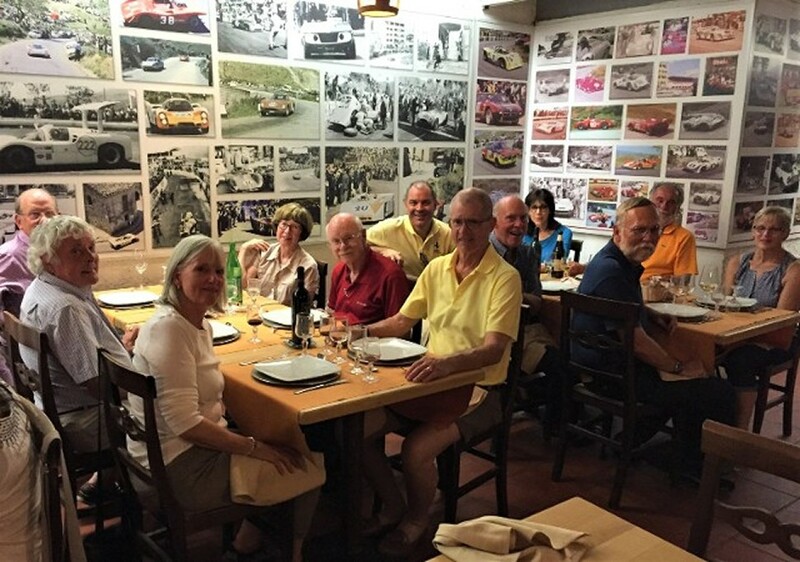 Small restaurants still cook the ‘anciente cucina’ and much of the experience is enjoying the local food while listening, and adding, to the race stories. Every citizen seems to have their own recollection of ‘the Great Race’. DAY 1 Sept. 16 Arrival day in Palermo, Sicily. This afternoon we journey to Cefalu and our beach hotel. This evening dinner is in the center of the old town where we have get acquainted drinks overlooking the Mediterranean before dinner. Those of you coming off the Goodwood Revival will fly from London to Palermo this morning. See flight options following Tour Price. 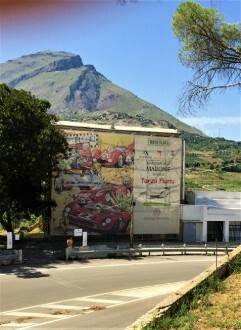 DAY 2 Sept. 17 We’ll cover the Targa Florio circuit over a two day span. This will give us plenty of time to enjoy the scenery, visit all the villages and enjoy un-hurried lunches. This morning we visit Termini Imerese where we are welcomed by Nuccio Salemi, the keeper of the Museo dell’ Automobilismo Siciliana e della Targa Florio. Following lunch in Termini Imerese we head up the course to the start finish line and visit the still standing Paddock and Control Center. 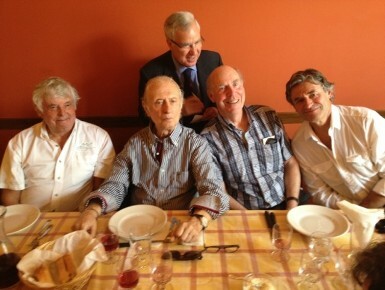 This evening dinner is at a famous restaurant bedecked with the history of the race. Day 3 Sept. 18 Our morning continues around the Targa circuit. 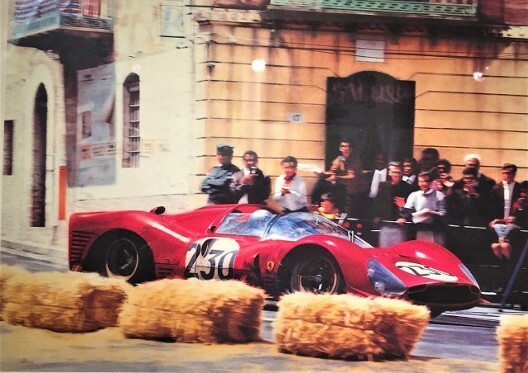 A visit to the ‘Museo Targa Florio’ is followed by lunch in the village of Collesano where it is anticipated joining, Sicilian ace Nino Vaccarella. We’ll be making stops at significant places including Cerda and Campofelice with a visit to the ‘Museo Biblioteca Vincenzo Florio’. 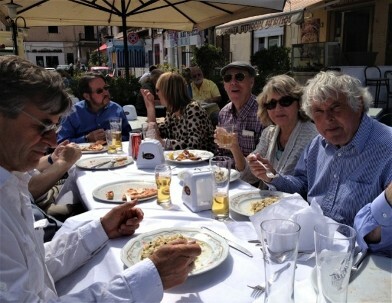 This evening dinner is at leisure in Cefalu. DAY 4 Sept. 19 Today is a very relaxed day to enjoy Cefalu. Naturally we visit the shoe shop of ‘Cic-cio’. Ciccio Liberte has made racing shoes for all the great race drivers for over fifty years, not only is he a great craftsman but a larger than life character. 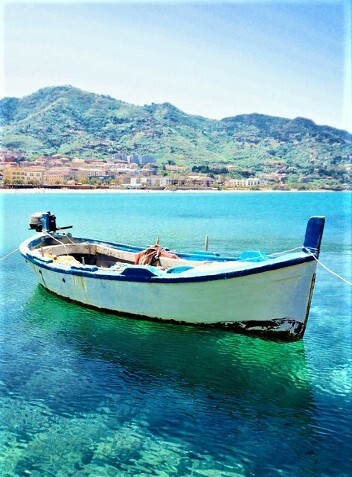 The sea front of Cefalu and the small town is a wonderful place to lay back, take in the Mediterranean sun and air. The more energetic can walk to the top of the escarpment above the town and have views of the whole coastline for miles. This evening dinner is on the sea front. DAY 5 Sept. 20 Much of the day at leisure in Cefalu. Later this afternoon we make our return back to Palermo and our connecting and ongoing flights back to the US or further travels in Europe. 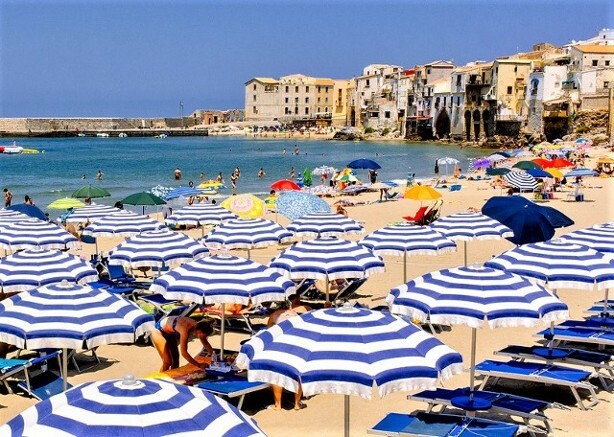 Our busy touring schedule still allows plenty of time to enjoy the beautiful beach and historic town of Cefalu. 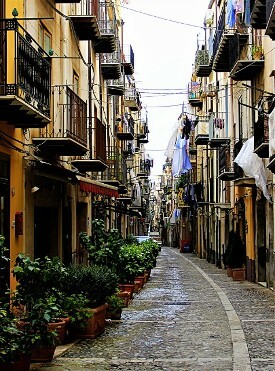 The small streets of the old town are wonderful to walk and shop. 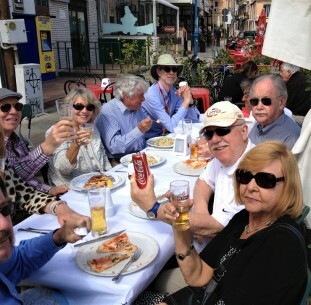 Open air trattorias, coffee and wine bars abound. 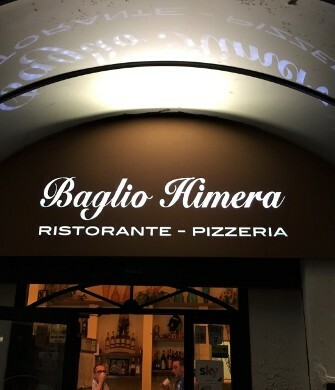 In the evening we’ll experience some of the best food Italy has to offer. You may even want to extend your stay. No problem! Not your average pizza joint! Air not included - Unless joining from our Goodwood Revival Tour, London/Palermo/London r/t included. We can also arrange very attractive London-Gatwick/Palermo/London-Gatwick flight schedules for around $350 per person, if you are not attending our Goodwood Revival tour. According to previous trips some people like to stay on for a day or more. 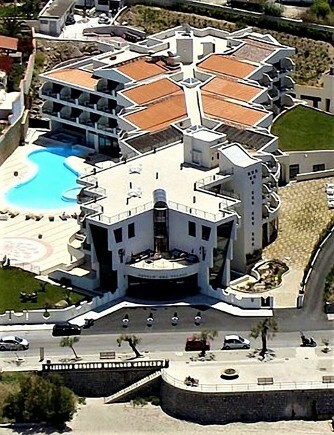 We can arrange this with the hotel, however, it will need to be made at the time of booking. September is the ‘high’ month for Cefalu. Most prime location hotels are booked at least nine months in advance. This trip is offered with the whole concept of it being a very relaxed and fun trip. Our great race drivers make this an incredible opportunity for you to spend real time with them, live the race through their eyes and experiences. This is also their vacation and they will be joined by their wives. They are all very much in demand by people/companies who pay a lot more than I do, and it could be quite some time before we could repeat this. It has taken four years to make this schedule work again. Finally, we are extremely limited to numbers. A $1,000 per person deposit is due with booking, fully refundable up to April 1 , 2019. Space on the tour is extremely limited due to hotel availability. Balance is due May 1, 2019. Cancellation penalties in effect after April 1. Insurance is available and suggested.